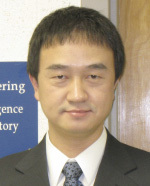 Dr. Chengyu Cao joined the Mechanical Engineering Department in 2008. Prior to that, he was a research scientist in the Department of Aerospace and Ocean Engineering at the Virginia Polytechnic Institute and State University. He received his Ph.D. in Mechanical Engineering from the Massachusetts Institute of Technology in 2004. He earned his B.S. degree in Electronics and Information Engineering from Xi’an Jiaotong University, China and M.S. in Manufacturing Engineering from the Boston University in 1995 and 1999, respectively. Dr. Cao’s research is in the area of dynamics and control, adaptive and intelligent systems, and mechatonics with focus on unmanned systems and aerospace applications. He is also interested in bio-mechanics, sensor and actuator networks, control of flexible structures, and fluid/combustion control. His current research projects are supported by NASA and Pratt & Whitney. He has over 80 publications in journals and peer-reviewed conference proceedings. Dr. Chengyu Cao invented a novel L1 adaptive control architecture which ensures guaranteed transient performance and stability margins with co-inventor Dr. Naira Hovakimyan. Through fast and robust adaptation, complex nonlinear uncertain systems can be controlled with verifiable and validated performance. Applications include aerospace systems, unmanned systems, flexible structures, etc.